Pape Nature Park is one of Latvia’s various nature reserves. It is home for many unique fauna and flora species and most importantly a birdwatching paradise. Human beings get to enjoy this rich environment through hiking and walking trails allowing them to get in touch with nature. 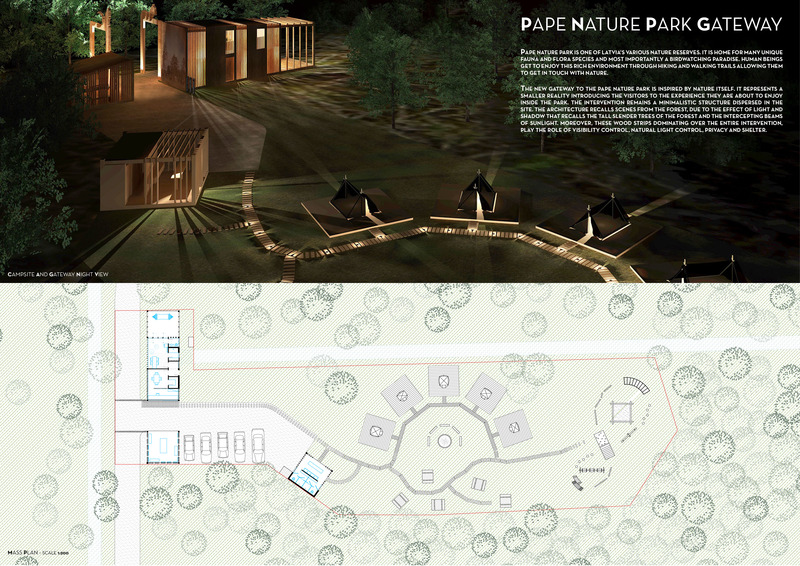 The new gateway to the Pape Nature Park is inspired by nature itself. It represents a smaller reality introducing the visitors to the experience they are about to enjoy inside the park. The intervention remains a minimalistic structure dispersed in the site. 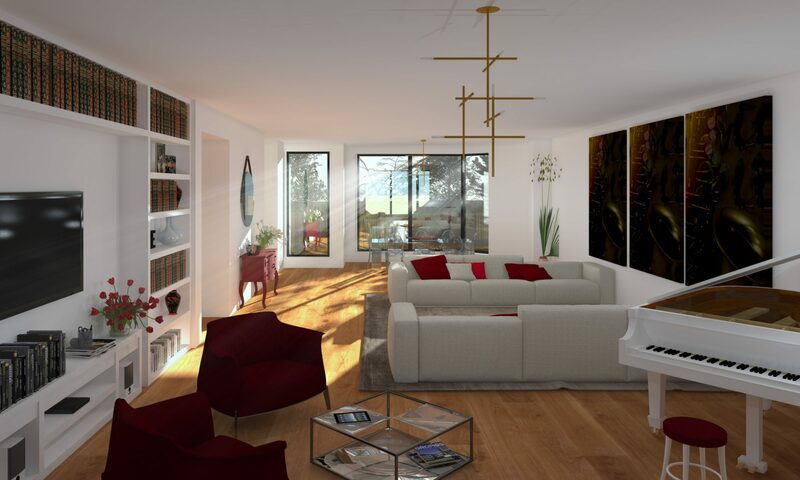 The architecture recalls scenes from the forest, due to the effect of light and shadow that recalls the tall slender trees of the forest and the intercepting beams of sunlight. 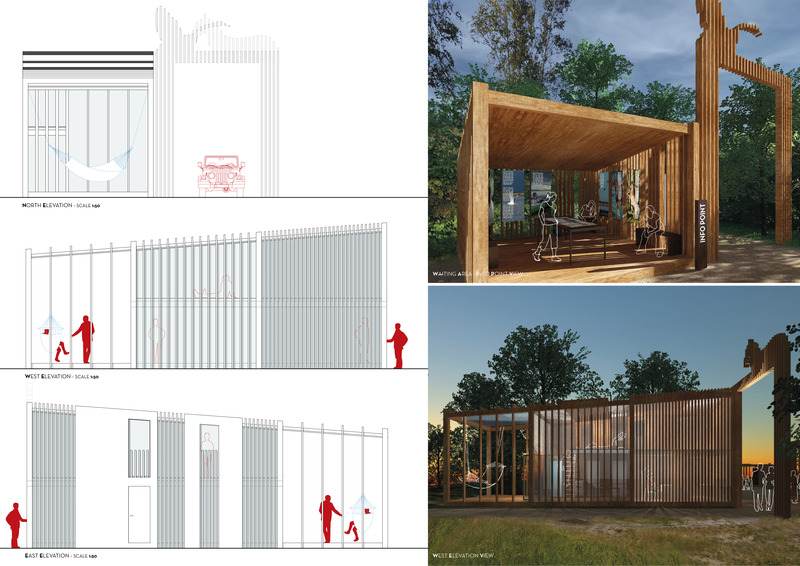 Moreover, these wood strips dominating over the entire intervention, play the role of visibility control, natural light control, privacy and shelter. The main material employed is wood and thus wood frame construction method. The use of this material is based on several factors mainly recalling its use in Latvian construction across history, in addition to its durability and its availability in local controlled forests. allowing easier replacement of elements and less vulnerability to damage. The facility is to be equipped with roof-top photovoltaic panels for power generation, whereas external lighting is ground-level fixed and independently equipped with smaller panels for independent lighting system in the campsite during closing hours. Rain-water collection system and filtration for potable water is foreseen. The main building’s roof is inclined with a 7.5% slope allowing rain water drainage through canals that collect in basins installed on the eastern side of the building and close to the services facility in the campsite. 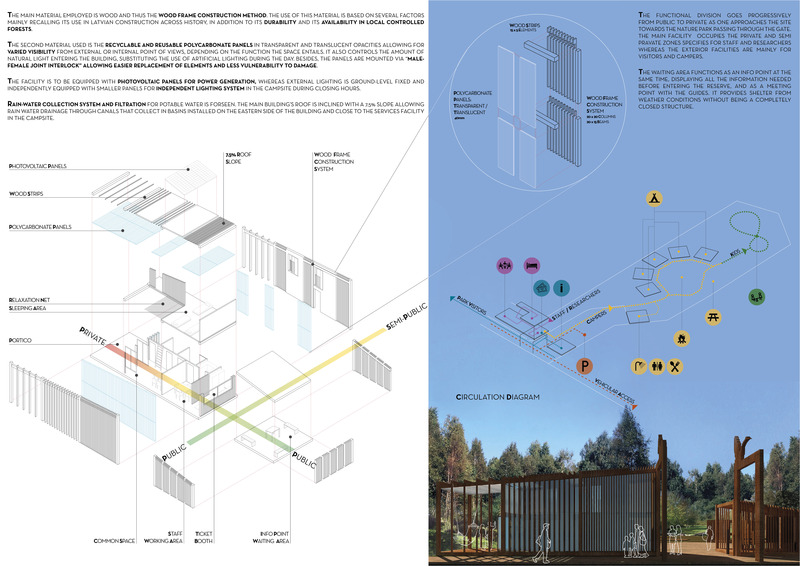 The functional division goes progressively from public to private as one approaches the site towards the nature park passing through the gate. 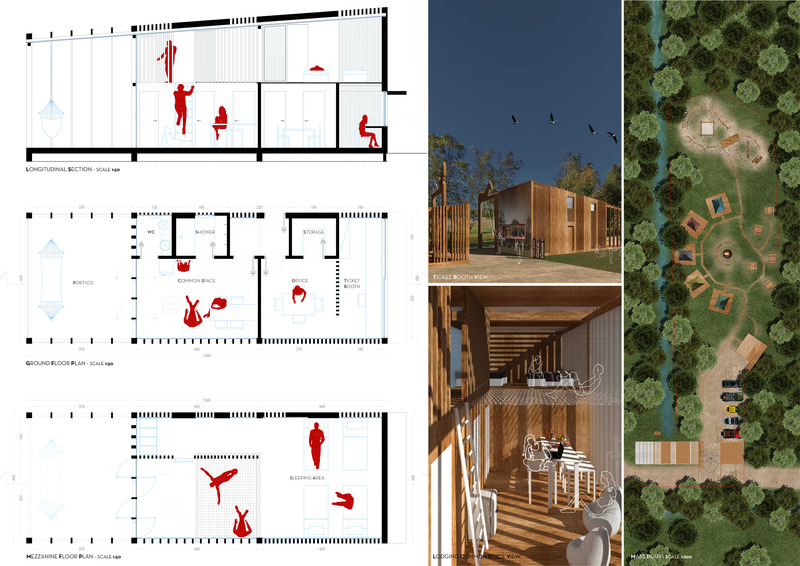 The main facility occupies the private and semi-private zones specifies for staff and researchers whereas the exterior facilities are mainly for visitors and campers. The waiting area functions as an info point at the same time, displaying all the information needed before entering the reserve, and as a meeting point with the guides. It provides shelter from weather conditions without being a completely closed structure.